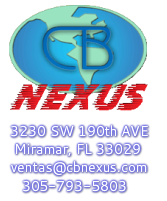 Founded in 2000, CB Nexus Corp grew out in the sale of computer hardware in South Florida. It’s principal having significant knowledge and experience working in the Latin America and Caribbean marketplace. Currently, we represent leading manufacturers such as HP, Toshiba, Acer, Nikon, Sony, Kingston, D-Link. Apple, Samsung, Blackberry, LG, HTC, Canon, Fuji, Dell and more. One of our main targets is a profit consistence growing, in a contrary position of most companies, that without planning, like to base their structure in a volume growing. To accomplish this target we improve day by day our research in new and/or innovative products where we can create a new segment that allows us to make the difference. We strongly believe, and our experience can talk by itself, the best way to consolidate business is to follow this rule. We pride ourselves in offering the best possible prices, excellent service, and an inventory of products that surpasses our competition. All products are backed by our knowledgeable technical support staff and manufacturers warranty. Our products and price lists are updated daily in order to provide you the best possible deal for any quantity.